Holy Stone Healthcare participates at 5th World Congress on Cancer Therapy during September 28-30 at Atlanta, Georgia, USA. Holy Stone Healthcare Co., Ltd. is going to 5th World Congress on Cancer Therapy during September 28-30 at Atlanta, Georgia, USA! It is our pleasure to be invited by OMICS International to present a topic about Novel Approaches to Cancer Therapeutics. 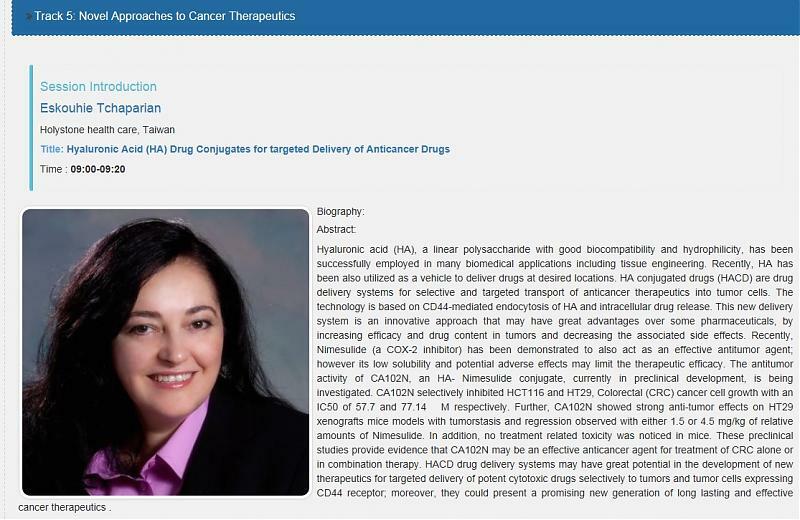 Dr. Eskouhie Tchaparian, from our Preclinical & Development Division, will give a presentation on the subject of Hyaluronic Acid (HA) Drug Conjugates for targeted Delivery of Anticancer Drugs at 9 am on Sep 28, 2015. For more information, please visit OMICS’s website.